Residents are returning to their homes -- or what remains of them -- as crews continue "mopping up" the Big Sur wildfire that destroyed at least 34 homes, reportedly including that of the local fire chief. That's a dozen more than officials had originally estimated. "It's a little challenging," said Pfeiffer Ridge resident Tara Evans, who says she plans to spend Christmas Eve helping her sister, who lost her home in the blaze. During the evacuation, "We could look back down and see it burning," she said. Evans put the best face on the tragedy. "We're going to dig in and help them out," she said. "It's certainly going to be a joyous Christmas, to be back at home. We got out with our lives." 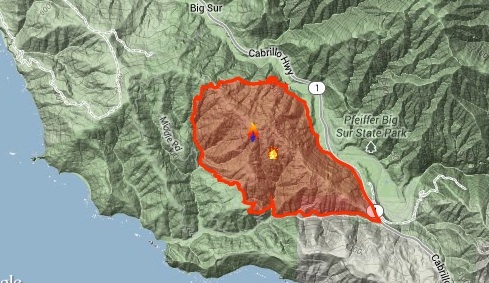 Designated as the Pfeiffer Fire, the blaze began around midnight of December 17th and led to evacuations along Pfeiffer Ridge Road and burned more than 900 acres in the Los Padres National Forest west of Highway 1. Authorities declared the fire fully contained on Saturday. Incident Commander Kevin Poyner says that at its peak, as close to 1,000 firefighters and support personnel joined the effort. Authorities said that damage assessment teams had completed "preliminary" surveys over the weekend and found little remaining of some homes. About 100 residents were displaced, at least temporarily. Evans, who says she was "born and raised in Big Sur," and been through several fires and road closures in the region, says, "Each time the community seems to come together stronger. The love and support we get from our neighbors literally blows me away." Evans, whose own home was spared, says neighbors were able to save some homes by pumping water out of a 30,000-gallon swimming pool. She nonetheless describes this fire as "incredibly hot" and "one of the more devastating" that she can recall. The fire was somewhat unusual for this time of year, when forests would normally be sodden by now with winter rains. But Evans says the particular spot where her home is located hadn't burned in about 100 years, so a large amount of fuel had accumulated. Published reports on Monday said that Forest Service officials were close to determining what caused the fire but on Tuesday, Poyner told KQED that the fire is "still under investigation" and there is "no timeline" for an announcement of the cause.